The most diligent political parties and candidates were all doing the same thing this morning: picking up their nomination forms, so as not to waste any time gathering at least 500 valid signatures in the country’s 106 single-member electoral districts by 5 March. This first hurdle is meant to separate the wheat from the chaff. The stakes are high for the parties. In order to field a national list and thus contest 93 parliamentary mandates chosen through a system of proportional representation, each party must successfully field a candidate in at least 27 of the country’s 106 electoral districts, spread across at minimum 9 counties and Budapest. In other words, they must gather a minimum of 13,500 valid signatures within two weeks. Even though under the system introduced by Fidesz a single resident can sign the nomination forms of multiple candidates in his/her electoral district, collecting the requisite number of signatures in a short time-frame is a difficult task. Many of our readers will remember how in the 2014 elections the youthful, energetic Fourth Republic movement (Negyedik Köztársaság – 4K) failed this first critical electoral test. Parties that do manage to field candidates receive lavish state funding. Each party that fields at least 27 candidates receives 150 million forints (approx. C$751,000) from the state. A party that manages to field candidates in all of the 106 electoral districts receives over 600 million forints, or just over C$3 million. While a new rule requires any party that receives less than 1% of the vote to refund to the state all of their public funding, most believe that Hungarian authorities will not end up collecting this amount from the “business parties” that are formed before elections (and disappear right after) simply to enrich its founders with public funds. It’s worth noting that for the next two weeks, Hungarians can expect to see candidates collecting signatures in major public squares, outside supermarkets and grocery stores and near public transit hubs. That said, candidates may not approach voters in workplaces, in government departments, in schools, kindergartens, hospitals or in clinics. For the sake of expediency and clarity, the candidate is permitted to fill in the personal details of the resident offering their support (such as the individual’s full name and home address), but that person must then sign the form using the same pen. Collecting 500 signatures is no easy task, and I would like to mention that three people who some of our readers will be familiar with from HFP or from my Hungarian-language publication, the Kanadai Magyar Hírlap, are running as candidates and will be busy in the next two weeks collecting the requisite number of signatures. They are diligent Hungarians who are running under challenging circumstances because they are passionate about issues of democracy, social justice or Hungary’s place in the western world. First, we have Sándor Kerekes–a Hungarian Canadian from Toronto, who moved back to Budapest a few years ago and lives in Budapest’s 11th District. (One of his pieces in HFP appeared here and many in Kanadai Magyar Hírlap.) He is running as the candidate for Lajos Bokros’ Modern Hungary Movement (MOMA), a party that defines itself as fiscally conservative, but socially liberal. Mr. Kerekes is running in Budapest’s 2nd electoral district. Mr. Kerekes speaks about the importance of tackling wasteful government spending, whilst improving the state of education and health care. And, of course, he speaks of restoring the republic and democracy. If you are in Budapest, you can meet with him and with Mr. Bokros on 20 February between 6:00 PM and 8:00 PM at Villányi út 11, floor 2. Mr. Kerekes has been especially persistent over the past weeks (and, indeed, months) meeting with residents in public squares and outside the district’s main market. Sándor Kerekes meets with residents on 15 February in Budapest’s 11th District. Sándor Kerekes in Budapest’s 11th District, on behalf of MOMA. 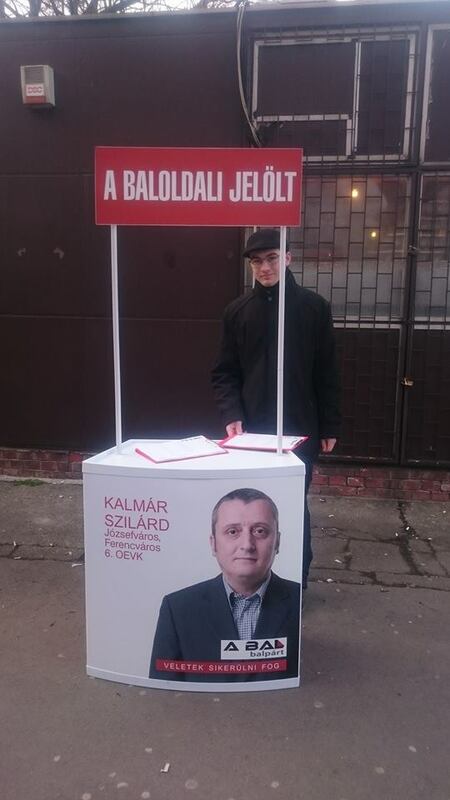 Not too far away, Szilárd Kalmár is running as a candidate for the Balpárt (Left Party) in Budapest’s Józsefváros-Ferencváros (the 6th electoral district). 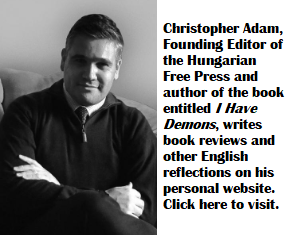 Mr. Kalmár’s articles have appeared in HFP, and several others in the Kanadai Magyar Hírlap. Mr. Kalmár, a social worker in Józsefváros for the past 18 years, is running on a left-wing platform focused on providing housing and stable work with a living wage to locals. Mr. Kalmár produced a video and you can watch it here and his team has been very dedicated in putting up election posters throughout the district. 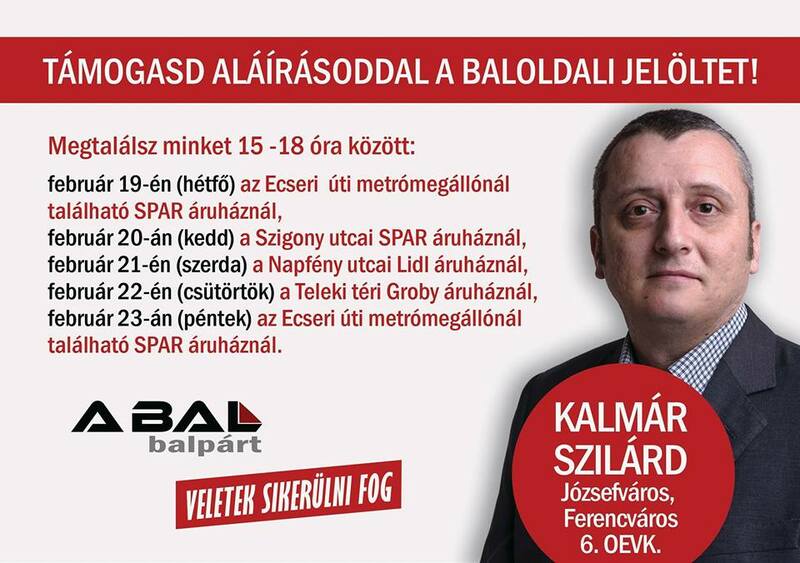 Szilárd Kalmár and the dates/times and locations where he is collecting signatures this week. On Monday, Mr. Kalmár and his activists were among the first to appear in public squares, collecting nominations. 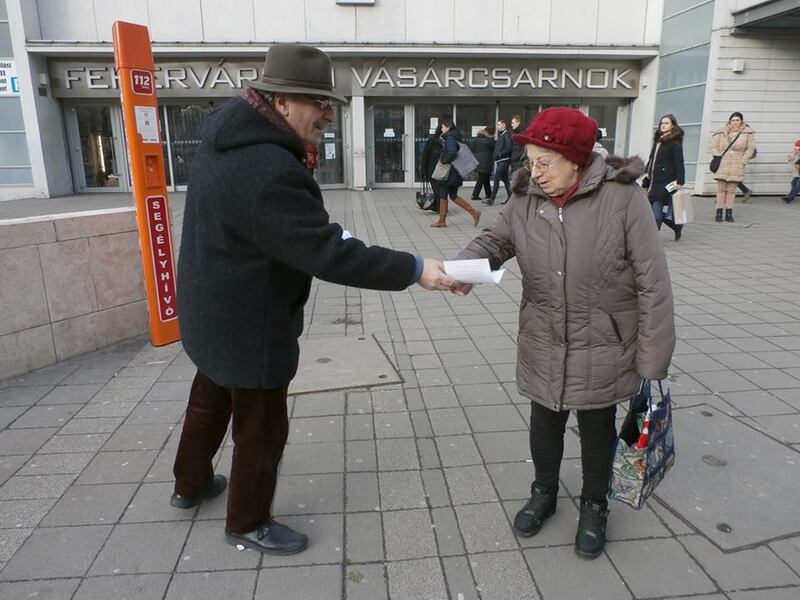 An activist for Mr. Kalmár collects signatures on Ecseri út Monday afternoon. Photo: Facebook. Readers of my Hungarian publication will be familiar with the articles of Viktor Szigetvári, the centrist-liberal Együtt party’s candidate for prime minister. 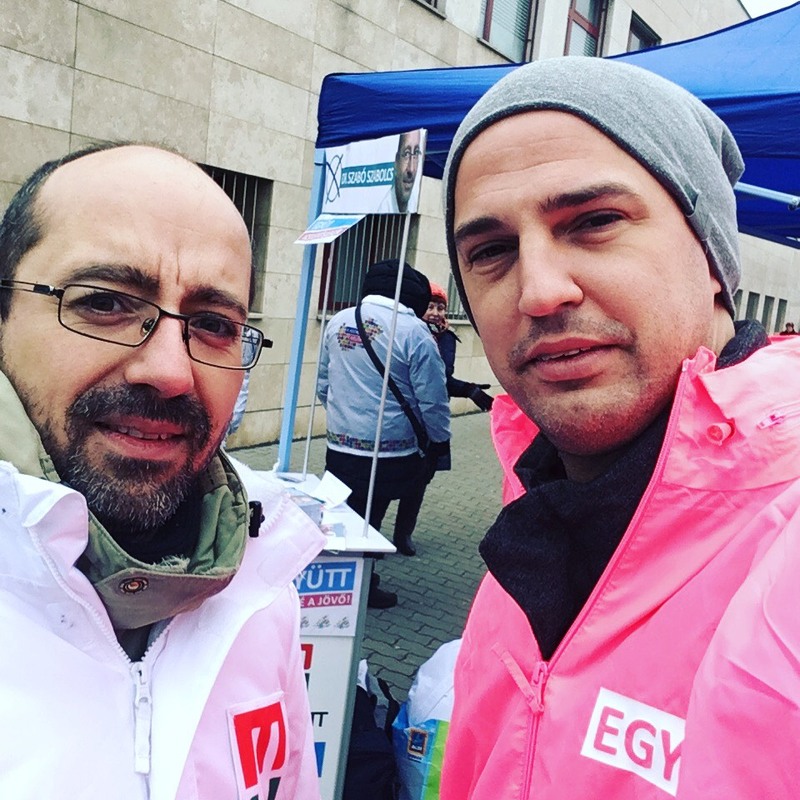 Mr. Szigetvári began campaigning yesterday, when he and a few dozen Együtt activists protested Prime Minister Viktor Orbán’s state of the nation speech outside the venue, calling attention to the corruption scandals engulfing the ruling party and specifically Mr. Orbán’s son-in-law. “The West is not an enemy of our homeland. It is our home, without which there is no future or growth for Hungary. And yet, Orbán considers the manipulative and blackmailing Russian dependency as an example,” wrote Mr. Szigetvári in his blog. Viktor Szigetvári (right) campaigning in Budapest on Sunday. 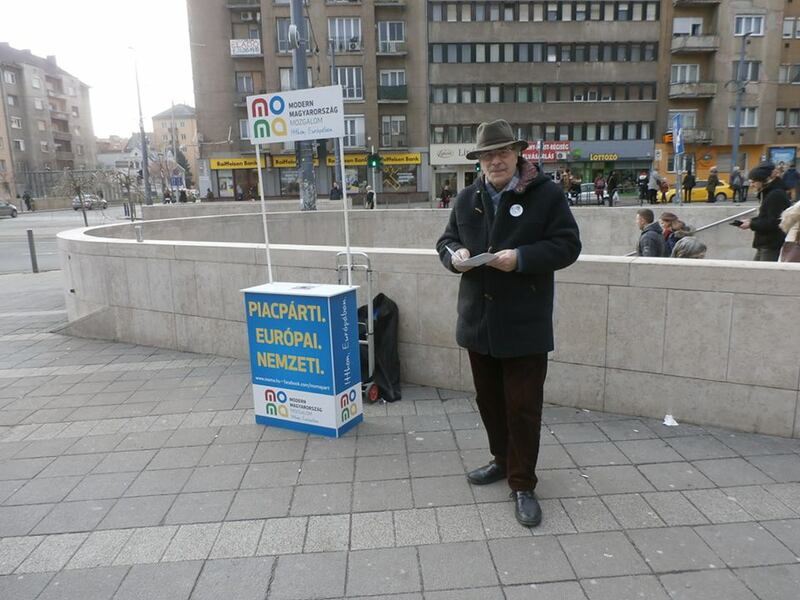 Mr. Szigetvári is collecting signatures for his run in Fejér County’s 5th electoral district and, of course, he is the face of his party in this election. We wish all three candidates–dedicated and engaged citizens–the best in the next two weeks. Oh boy, what a system ! All the western politicians would eat their hearts out. There, the “wannabees” receive the tax-payers money to campaign, and they want voters to go to them to sign their support. They should spend their own money and go to the voters to sign the petitions for them. Go door to door, like they have to do in the west. Akos sure was not far from the facts! First of all, one of the “wannabe”, Szilárd Kalmár, and the Left Party does not receive a cent from the money of taxpayers. Only those parties receive campaign support who have at least 27 candidates nationwide. Also, if these parties do not reach at least 1% of the votes, then the whole support money will have to be repaid. Secondly, our (the Left Party) activists go to the people and do not expect people to go to them. We have only two this kind of booth on the streets…meanwhile other parties has hundreds. Just for the sake of accuracy. I much prefer when political candidates raise their own money for campaigns from private donations. If they can’t raise these funds, then that is an early test of how successful their campaign might be. And if they fail that early test, they probably have little ability to raise the support and interest of voters, and they should bow out of the race. You are right! There is nothing like getting the best government that corporate money & other interests can buy. Greatest flaw in Western democracy as far as I am concerned. Government funding of politics is not great either, but I think there is an argument to be made for “lesser of the two evils” concept here. Every 4 years the circus comes to town in Hungary, to cash in on the generous state subsidies available for political losers. In this country, it pays to lose. This year 84 parties are running for the big bucks, and the cleverly designed financial incentives, designed to fragment the opposition vote to Mr. Orbán. Of the three parties mentioned in this article not a single one has any kind of nation-wide permanency, institutionalized relationship with the people of Hungary. Why not ? Because these so-called democratic parties are unable to do the kind of work required of mass parties between elections in Western Democracies. In Hungary, it pays to lose. Buffee Ste Marie, the Cree Indian Songstress and poet once sang – “My country, ’tis of thy people you are dying”. She could have been speaking of Hungary: a country with a political culture tailor made for autocrats like Viktor Orbán and his Russian puppet master, Vladimir Putin. He will, once again reign supreme, at the end of April, while the other three kind hearted gentlemen will no doubt turn to writing some heart wrenching narratives for this and other papers read by less than 1% of the Hungarian public, and prepare for another kick at the can in 2022. Let the show begin…. I suppose this will the biggest show of the year in Hungary. But what if the voters will feel turned off , disinterested and will not turn out to vote? Lots of “wanna bees” pocket all the “election monies”. Then it will the most expensive show in town. Again, HFP convinces me that Akos was right. If the opposition were willing to do a reality check, they would realize that there is no precedent of an authoritarian regime being booted from power through peaceful, free and fair national elections. This has not happened in Russia, Venezuela, Zimbabwe nor in Turkey and it will not happen in Hungary. These regimes are more likely to eventually implode due to internal dissent and pressures, or to reorganize and “reform” under a new leader. But to think that any opposition party can remove Fidesz from power through democratic and peaceful means is foolish. It will not happen in 2018 and it will not happen in 2022. With the economy growing above average compared with regional former communist peers, wage growth strongest in the OECD, with low unemployment, while debt/GDP continues to decline at government & consumer level, I am sure that dissent is just on the horizon. Or perhaps, for as long as Hungarians will remember the twin debt crises Hungary was stuck in thanks to current opposition, which nearly put Hungary on to the same path as Greece and the immediate aftermath, which wiped out a decade of gains in wage gains and economic & social development, they will not give that bunch another chance. Especially given that the current government did rather well in repairing much damage to the economy. And just what the hell would be wrong with a free democratic system of election. In order for the people to chose any one, it must be free foe any one to run. If they have a party behind them, let the party finance them. That is how it works the normal way. What they have now is a fixed system. The individuals have no right, so no chance, only the parties do what they want. Could any one name just one single thing that seem to be at least close to “normal” in Hungary ? ‘When expressing opinions in general, the exceptions are excluded, or disregarded as being so minute, therefore not worth mentioning’ ! I know, one always can find some exceptions in everything. Even the article gave general ideas, and that is all I noted. That is all that I intended as the over all system and present situation there and now . I intentionally disregard those “exceptions”, because that would only make my comment partial. I just hate partiality, it’s not fair and bias. If the subject of the article had been not the over subject of the upcoming elections, that had been a subject on some specifics. If there is a political party, just how come it can not find 27 of its members that could stand in as it’s candidates? Seem like it is a party of only one person. The party boss, member and the only candidate. Just why do not join him, would at least make two. But my question again is, just why can not anybody run ? Let the votes pick the one they find to be the best. Is not that what democracy suppose to be? I am grateful to the management of this blog to feature my humble efforts and also for calling my attention to it. Let me note here, once at this subject of the election, that indeed many, if not most of the nominating parties are motivated by the state subsidies concomitant with the nomination. However, my party, MOMA, or Modern Hungary, etc. decided that it is too risky and, what’s more, incompatible with the party’s philosophy: we cannot criticize the all pervasive, general abuse of state finances from every direction, if we are participating in it ourselves. Therefore, the only party on the slate, whom are campaigning on their own money and shun any state financing, is the MOMA. We are also proudly explaining to anybody willing to hear it, that we are not in politics for its financial benefits, we do not need the money, the jobs and do not need the perks either. We are all independent financially and pay for our campaign from our own pocket. In this respect the MOMA is alone today in Hungary. Will this be enough to elevate the party above the appalling level of voter’s apathy? We don’ know yet, but surely it would be nice and beneficial to the country that sorely in need of sober, thoughtful government, personal decency and economic take off that all so long have avoided this deeply troubled country. Sorry to enter more comments on the heels of the previous one immediately, but there is plenty to say to previous remarks. To Lanark I say that you are mistaken. The authoritarian regimes were put out of business peacefully in Greece in 1974, in Mexico, after 75 years of uninterrupted rule, in Chile, in Argentina, in Brazil, in Paraguay, all in my life time. To Peter I must say that you probably gain your information from the government press. And that is a dangerous thing! The former communist countries almost all far outgrow Hungary, some of them doublefold. The only exception is Bulgaria. Further more, since the EU contributes to the economy to the tune of 5% of the GDP, deducting this from the anemic growth rate of Hungary you will find probably zero, if not negative growth. The wage growth is a legislative smoke and mirror act. The employers are forced by law to pay more, therefore they withdraw the benefits to compensate themselves for the cash outflow. At the same time the government is paying zero increases to its own employees. Real wages are stagnating, especially if you calculate it in relation to the inflation. The pensions are also loosing ground. Low unemployment is an other dishonest statistical trick, inasmuch as it includes the over quarter million public workers, slaves really but in name, and also the emigrant population, amounting approximately to 600,000 who’s number can only be estimated because the government forbade the statistical office from keeping account of them. Debt to GDP has declined 2%. Debt nominal amount increased from 74 billion to 79 billion. If you add the unfounded obligation of the confiscated pension investments, the unaccounted debt of the Exim Bank, and a few truly interesting items, like the soon due Immigration Bonds, the government owes 92 billion forints, that is near 10% of GDP. Smoke and mirrors. It is no accident that the inflation is rapidly creeping up and the government is helpless in controlling it. The nominal rate is seemingly modest, but in fact the consumer goods are frighteningly increasing. The alleged similarity of Hungarian finances to that of Greece in 2010 is not more than a lie. It is so absurd that I cannot waste my time in addressing it. The current government not only did not repair the economy, but severely damaged it and its immediate future prospects by squandering and stealing thousands of billions withdrawn from the education and health care systems and a large proportion of the EU convergence funds. These latter enormous sums have been spent on idiotic projects that will never produce anything, or, even worse, that will require further expenditures in maintaining them, see the countless stadia that already unable to find monied management, because they are sure money losers. Sandor, Sandor, must agree with you at least on one thing. Never let Hungarians touch money, or even close to it. They destroy anything related to economic. But never forget, all those government social programs cost money, and government have NO money of its own. Can only spend what it takes from the people, called taxes. Debt, has to be paid back with interest on it. So it is money wasted. That’s the price of socialism, that’s why it could never function any place on earth. Never will ! How can government “order” any corporation to increase salaries? My dear Bendeguz79, nothing is easier than that. They get Parliament to vote in a minimum wage legislation and from that day on, the minimum wage will be as dictated by law. From that moment those workers, who were paid minimum wage get a raise and everything instantly become more expensive. The workers get a small increase, but their taxes go up, the increase will not be more than a few forints, but the government by this maneuver has just angled out some additional coins from pockets of the employers, without doing anything for it. Of course, all other workers whom are now barely getting more than the new ”minimum” wage, become restless, and start demanding more. More means more cost to employers, more taxes to the government, increasing prices, increasing inflation and increasing labour unrest. A recipe for economic mayhem. And why do you have this mayhem? Well, because your hapless and idiotic government interfered in the market and didn’t leave it well enough alone. This is how the government ”orders” the entire economy to increase salaries. And thank you for asking. Corporations receive their charters from the State, which is the ultimate guardian of the people’s rights in a democracy. Can you follow me Bendy ? If you ever tried to set up a corporation, you should know that, the State is the institution that keeps corporations in line, ensuring that they abide by their charters, and do not exploit their workers, and customers. If Banks charge exorbitant interest rates, the State can intervene. If corporations pay slave wages, the State can intervene. That’s how, Bendy. The eternal belief in the eternal wisdom of the free market lives on in the ignorant minds of those who have not seen what the monopolistic behavior of corporate leaders did at the turn of the 20th century, who have not seen how they laid waste to the world in 1931, the role they played in the rise of Fascism, Communism, Nazism during the first half of the 20th century, or how they brought the global economy to its knees in 2008. They are hard at work on an encore under the umbrella of the Orange-man in the White House, telling the common man to eat pie, while they stuff their own and cronies pockets full with cash, reducing the ability of the public to stimulate growth and development, just as was the case immediately before the big crash. Every single crisis of Capitalism was self inflicted, the product of unchecked corporate greed rather than government action in defense of the public interest. Prove me wrong Bendy !